Guest Post from Dr. Aaron Dinin. 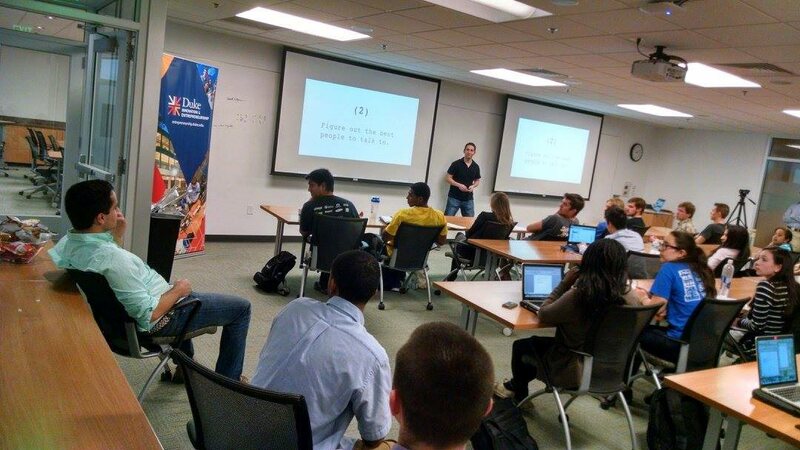 Three years ago, I began teaching a class for Duke’s Innovation & Entrepreneurship program called "Building Global Audiences." In the half-dozen semesters since then, I’ve revamped the class twice, but its core thesis has remained the same. "Your product doesn’t matter," I tell students on the first day, "if you don’t know how to get your product seen by the right people." In previous iterations of the class, I would begin the semester by asking students to "pitch" product ideas. Students would choose their favorite three, then they’d form teams and spend the remainder of the semester promoting their product ideas in order to practice growing an online audience. Despite my best efforts, that course structure always ran into what I started calling the "idea bottleneck." Even though the class was supposed to be focused on audience development, we spent much of our time workshopping ideas. Since the goal of "Building Global Audiences" is to… well… build audiences, I made another big change to the class structure at the start of this semester. Instead of having students work on their own ideas, I decided to find existing projects that wanted our help reaching more people. By doing this, we could avoid the time consuming process of developing ideas and, instead, focus entirely on growing audiences. Health Humanities Lab – "An innovative, interdisciplinary approach to advancing the health of populations worldwide through scholarship and practice grounded in histories, languages, and cultures." Humanities Futures – "[An exploration of] possible trajectories of the humanities in the wake of interdisciplinary developments of recent decades, particularly the rapidly changing paradigms and practices in research, teaching, publishing, and public engagement today." FHI YouTube Channel – A collection of nearly 400 videos documenting, sharing, and promoting the hundreds of lectures, workshops, seminars, conferences, and other events supported by the Franklin Humanities Institute every year. At the beginning of this semester, instead of pitching ideas, we began the class by dividing into three teams of six students. Each team is assigned to one of the above FHI projects, and their work for the semester is to identify the ideal project audiences, determine where their audiences are most active online, and then provide the managers of their respective projects with a comprehensive strategy for reaching those audiences. Unfortunately, for reasons both logistical and practical, the students won’t get to do much audience building work directly for their FHI projects. In other words, they won’t be creating content, posting to social media, buying advertisements, and so on. However, in the spirit of the course topic, I’ve asked them to document their work here, on the I&E Education Team blog, so that we’re building our own audience. Throughout the semester we’ll post about our learnings and our progress. Our topics will range from search engine optimization (SEO) to social media content dissemination strategies. We’ll be conducting user interviews, we’ll be identifying "competitive" projects, and we’ll be finding online communities receptive to promotional content sharing. While I don’t expect the audience for these blog posts to reach the size of the audiences of our FHI projects, I hope what we post is interesting to some people. Specifically, if you’re interested in reading about a group of talented young entrepreneurs and scholars exploring a vital skillset in a world increasingly mediated by digital communication technologies, then I hope you’ll follow along with our progress. Want to get all of our posts? Subscribe to the I&E Education Team blog or follow Duke Innovation & Entrepreneurship on Twitter. Aaron Dinin teaches in Duke’s Innovation & Entrepreneurship program. He majored in English as a Duke undergraduate (Trinity, ’05), and he earned a PhD from the University of Maryland, College Park, where he studied digital humanities. He’s launched multiple companies, been named a Microsoft fellow, and was a member of 500 Startups. If you’d like to read more from him, Aaron (very) occasionally blogs about his experiences teaching entrepreneurship at aarondinin.com.